Swim coaching manuals from the early 1900s up through the mid 1990s and later have traditionally focused on drills that include kickboards, pullbouys and high volumes swimming as a means to improve. Coaches who learned to swim during this time period are now in their 40s & 50s and responsible for coaching youth, high school and collegiate athletes, as well as mentoring younger coaches. That’s why you hear of “traditional instruction” as opposed to more modern and efficient swim instruction. Coach Terry Laughlin of Total Immersion brought more modern skills to the lay public through his swim camps and books on self coaching. Inspired by Bill Boomer, new ideas of learning to float and be supported by the water, rather than struggling to stay on the surface, became common place. Efficiency in swimming skyrocketed when these balance, posture and streamlining ideas began to spread beyond coach boomer’s personal contacts. By breaking down swim skills into small manageable components and then reassembling, your swimming stroke can be transformed into one that is smooth, enjoyable and faster than you have experienced. The secrets of speed already lie within your own body and our job is to help you experience and understand how to apply this in your swimming. Most swimmers contact me because they want to swim faster…or they want to enjoy swimming more in order to pursue healthy physical activity. Whether you’re a rockstar triathlete or a retiring school teacher or any where on the spectrum of swim speed, you’ll learn to enjoy the PROCESS of learning to swim better. We make swimming a mindful activity that infuses you with energy, helps you escape from the daily buzz and stress of your life, and incorporates whole body movements in a non-impactful, endurance and stress-reducing pursuit. AND you’ll swim faster as a result. Many triathletes and exercisers dread the process of getting up for the gym, getting ready, changing and going to do a ‘work out’ for any variety of reasons. Maybe you’re nodding your head right about now? By focusing on the process of swimming and getting your mind in the right place to practice gentle movements you’ll find yourself more energized as you learn to swim better. Through this regular practice you’ll not only become a better and faster freestyle swimmer, but you’ll also begin looking forward to the pool as the best part of your training day. Who Should Take Swim Lessons from Steel City Endurance? From learn to swim and complete your first triathlon, to crossing the finish line to qualify for Kona, both beginner AND elite triathletes can make improvements to their swim. For the elite athlete, the basic laws of hydrodynamics can get challenging to manage as your speed and skills improve. It seems counter-intutiive, but to maintain progress and get faster at swimming, you need an experienced eye to help show you what you can’t feel or see on your own. 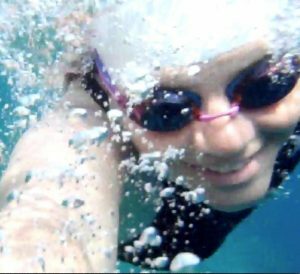 Steel City Endurance has a very non-intimidating approach that will ease you ito the water at your own learning speed, helping you gain confidence for your next trip to the beach or snorkeling vacation you’ve always dreamed of. Improving your relationship with the water helps you be more confident AND safer around any water activity. You’ll find yourself passing your old lanemates wondering what you’ve done differently and looking to YOU for instruction once you learn the fundamental mistakes that are holding you back. If you’ve got joint arthritis or need to swim for your cardiovascular health, being able to swim easily and without stressing your neck, shoulders and back is vital for you to continue a healthy lifestyle with swimming. Sign up for one on one or small group lessons. 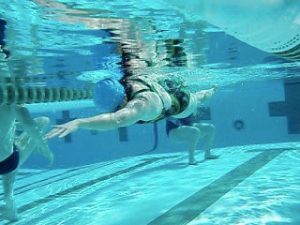 A minimum of three one-hour, or six half-hour lessons are recommended to allow you to completely transform your stroke for beginner, intermediate and fearful swimmers. Included is video evaluation above and below water, with expert stroke analysis. Technique development tailored to your current level of ability, clear instructions on how to structure your practice before your next less. Lessons are 55 minutes long. Sign up with a swimming buddy to improve your ability to practice proper swimming between lessons and on your own. Learn what to look for in your parters form so you and your buddy can self-critique when swimming without an instructor. Minimum lesson length is 1 hour. 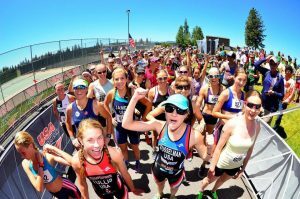 Discounted prices apply to current members of any USA Triathlon Club: $10 discount on all swimming lessons, $15 discount on packages of 3. Do you use a power meter or heart rate monitor for every cycling workouts? Do you know your training zones by heart? Do you regularly execute a threshold test set every 4-6 weeks throughout the year as your fitness improves? If so congratulations are in order…or are they? Executing a workout well often means hitting prescribed training levels such as a target heart rate or power zone. But an even more powerful training skill to master is nailing the effort level without out prescriptive guidelines. Instead of having a pre-determined target to hit, you ride (run/swim) by effort following the guidelines of the workout and tuning in to your body’s response and signals. How long can I sustain this effort? Can I work at this level of dis-comfort for another 4 minutes without fading? Can I repeat this focus level for another three sets of the same activity? Is this recovery level easy enough that I can do another hard effort for the next eight minutes? Nailing the workout intention when using effort alone means you’re in tune with how your body is responding to effort that day. But it takes practice! The first time you execute a workout like this, you may, in fact you will fail miserably. You’ll start too hard and won’t complete all the efforts. You’ll finish too easily and not hit the desired intensity. You’ll look at your hear rate tracing after the fact and see a line that looks like the profile of the Hilly Billy Roubeaux instead of even like the Sahara desert. IN other words your efforts were all over the place, rather than steady, even and repeatable. You’re thinking, “But coach, just give me a power target and I’ll hit it”. Success in triathlon is not always about hard work. It’s more often about being in tune with your body on a consistent basis and relying on that instinct you’ve developed on race day. Power training is fantastic, but there’s no substitute for your intuition about your own body’s performance. There’s a recipe for developing this instinct. Given any specific task, complete the workout in a “practice” mode. You’re not trying to build fitness, nail a heart rate zone, get anaerobic, VO2 max-ish, or wherever the effort falls on a physiologic scale. You’re trying to tune your instincts to hit the intention of the workout. ie “go hard for an hour”, “run easy for exactly 30 minutes”, “execute three evenly paced efforts with 2 minute rest at the maximum of your ability”. It may be hard to see how it’s different to hit a power range for three eight-minute efforts, versus doing the same effort without targets and going just by feel. The first is “prescriptive”…your efforts are given by your coach or your spreadsheet of training zones. But your spreadsheet doesn’t know your body’s ability on that specific day, and your coach won’t know unless you are in a daily training environment or communicate intensively on a daily basis. In the second example, the power is “descriptive”. You or your coach look at your power levels, effort or heart rate zones AFTER you complete the workout instead of before or during. You improve your ability to understand your body while executing a practice session, rather than a workout. While practicing, you’re also developing the specific fitness needed to improve your fitness and master the pace, master the effort and tune into your body. On race day, it matters less what your power or heart rate targets are…it matters more if you’re operating within your body’s ability to cross the finish line having used your energy wisely and finishing in the fastest time you’re capable of. Once you master the workout you can learn to push your abilities while still maintaining the practice intentions. Maybe it takes you three ‘practice sessions’ to do an evenly paced 3 x 8 minute effort with 2 minutes rest. “But Coach,” you protest again loudly…”If you’d just give me a target, I can do it right the first time!” Right…but that’s not the point. Building fitness is easy. Anyone can prescribe hard workouts. Online training simulators like Trainer Road, Zwift and Sufferfest can help you do testing sets, tell you how to crunch the numbers (or do it for you) and give you back more training sets to do. That’s algorithmic. But coaching is an art and racing well requires practice…not just fitness. Practice executing specific workouts by listening to your body. Repeat these efforts to do it “better”…more evenly paced within the workout guidelines. See what your heart rate and power were AFTER the effort is done. Are your efforts even or ‘hilly billy’? Is each effort similar to the previous or do they get less intense as you get more fatigued? Or is the first effort even and the second and third efforts ragged? Reread the workout guidelines and see if you executed it well. If you did, congratulations! You now have a baseline. Next time you try it, see if you can push just a little bit more. If the workouts are well designed, you’ll be building the fitness you need, but more importantly, building your reservoir of body sensing, pacing and confidence in racing. “Training is about teaching yourself to understand your boundaries and then slowly pushing those boundaries up. You need to know how to feel those and where they are! I say go out and try to get in touch with your perceived exertion and your body rhythm at least a few times a week in all the disciplines of our sport. Most of the time in training, especially when I go to a new town, I often test myself by doing the following. I leave the hotel room for a run and check the clock before I leave. During your next training session, try putting black electrical tape over your power meter or heart rate monitor. Turn off Zwift and Trainer Road and go old school while listening to tunes, or watching a scenic youtube video. Learn to “practice” rather than “workout”. You’ll tap into a new set of skills needed for triathlon speed, success and enjoyment. 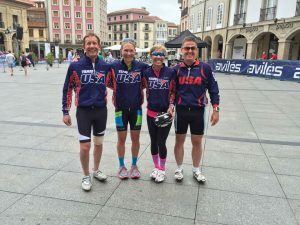 Steel City Endurance had FOUR athletes represented at the Age Group national championships just two weeks ago (the same time the Olympics were going on, making it doubly exciting! Michelle Johnson McClenahan and Kirsten Ingeborg Sass both competed in the Olympic & Sprint Distance races held on Saturday an Sunday, both are coached by Coach Suzanne. Matthew Martino amd Richard Albertson lined up for their start at the Olympic distance race Saturday morning, both Matt & Rich are coached by Coach Michale Bauer. The big story of the weekend is the remarkable accomplishments of Kirsten Sass, named the 2015 Triathlon of the Year and Duathlete of the year (first time ever one athlete has received both awards). Kirsten finished 1st in her age group and 2nd overall in the Olympic Distance Race on Saturday. The next day she finished 1st again in her age group, as well as first place OVERALL in the sprint distance race, beating the 2nd place finisher by just 3 seconds! You can learn something from 100m sprinter Simone Manuel or distance specialist Katie Ledecky, regardless of which one of these remarkable women is your hero. Streamlining and drag reduction in the water helps us conserve forward momentum because water is 800 times more dense than air. Anything you can do at any point of the stroke to become more streamlined, even as you’re trying to swim faster, will allow you to swim better, with less energy. Why? because slowing down is what humans do best in the water! Staying fast means paying attention to small details…for example, the “crossover effect”. The Crossover effect occurs because of the way our shoulder joint is oriented, and the fact that we are used to operating in our daily lives with our arms reaching, holding and manipulating objects directly in front of us. When we turn our upper body, we are usually still operating in the frontal plan, or the plane that divides your body into a front half and a back half. the shoulders lift the arms forward and typically our arms stay in front of us most of the time. Picture things like typing, driving, cooking, cycling, having a conversation with someone (arms folded or hands in front pockets) as typical things we do. We carry this habituated position of the arms into swimming and as a result, while you don’t feel like you’re crossing your arms in front of you, the effect is that arms cross midline of your direction of travel. This is a key point, and the reason it’s so difficult to correct…your arms are still in front of you when you crossover in swimming. The crossover effect is that you direct your energy diagonally instead of the direction you really want to go! How frustrating, right? Believe me I know. But sometimes you don’t know you’re doing it until you see a video or photo of yourself, or have someone physically make that correction for you. Here are two examples from the 2016 Olympics, Katie Ledecky in the first photo, and Simone Manuel in the 2nd photo. Their arms are extended parallel to the lane rope, right? The arm is aligned, no crossover. The effect of arm aligned, is that momentum continues forward. However look at where their sternums are directed, and look at their body rotation. Now imagine those activities I mentioned previously…driving, typing, shaking someones hand. If Simone Manuel were autographing a gold medal photograph at this moment instead of swimming, her left arm would be pointed way over towards the right edge of the photo in a diagonal direction, right? Her arms would be “in front” of her chest, or directed to the right, since her body is rotated to the right. When the body is actively rotating in freestyle (or backstroke), the lead arm aligned requires you to have the sensation that your arm is kind of off to the side a bit, even sticking out. Visualize yourself in their rotated positions in the pool…now hold your arm above your head and visualie where hte surface of the water and where the lane rope would be. Can you get your arm lined up with the lane rope? It will feel far off to the side. Avoiding the crossover effect is one easy trick you can practice while standing in the mirror so that you start to develop your Olympians freestyle stroke! How else can you practice it? I wrote a book all about it ! 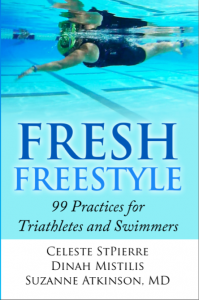 In Fresh Freestyle: 99 Practices for triathletes and swimmers, we included specific focus on alignment and eliminating crossover. Practices 10 from Coach Celeste, 36 from Coach Dinah and 68 from Coach Suzanne inFresh Freestyle address these skills. In the meantime, don’t try to sign any autographs while swimming, things will get messy and you’ll avoid the crossover effect! 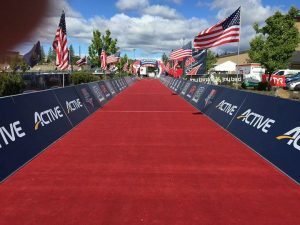 Duathlon National Championships – Bend, Oregon. Tested the limits big-time. Beautiful city, challenging course, great competition, wonderful time meeting up with old friends and making new ones, and an absolutely fantastic job by USAT, Tim Yount, and the Duathlon Team putting on a top-notch event. If you can run and ride a bike – make this your goal for 2017. Go to Bend. Test yourself. It will be worth it! Sunday morning, waiting for my flight home, I met a girl (Kirby Heindel Adlam) whose 2nd duathlon EVER was the world championships in Spain. Now THAT is incredibly inspiring. Nothing ventured, nothing gained. The opportunity is yours for the taking – why not seize it with both hands!?!?! Bobby McGee – what I learned from him in running was all that got me through that second race (whew! ); UCAN nutrition also saved me for that second race, Lynn Greer for the awesome new race suit/helmet/shoes/all my biking needs; to John Lines for all the support and encouragement; and to ALL of you who cheered from near and far – you keep me going!!!! Thank you, thank you, THANK YOU!!!!!!!! ?#?USATDU? ?#?steelcityendurance? ?#?UCAN? ?#?kask? ?#?fizik? ?#?racedaytransport??#?testyourlimits? ?#?Elvis? ?#?ilovemybike? ?#?hills? ?#?lifeisgood? Last weekend I participated as a guest coach with Dinah Mistillis of Discovery Aquatics to help teach a two – day swim clinic. Dinah asked me to lead a 15 minute talk that was a condensed version of my “Every Day Skills for World Champions” talk that I gave in Minneapolis as keynote speech for the Total Immersion Coaches Summit in May. For this open water clinic I chose three key skills to share with the dozen swimmers present on Sunday. My first key skill was “Plan a Map to Your Success.” In order to plan your way to success in swimming or triathlon, you need to know of course where you are now, and where you want to go. In the context of open water swimming, recognition of problem areas might included open water anxiety, difficulty swimming in a wetsuit, trouble sighting in open water, that pesky left hand that smacks the water…this list can get really long! It’s easy at this point for swimmers to feel overwhelmed. The reality is that each of these skill and mindfulness issues takes time to address. While Dinah and I were discussing this, she shared a quote with me…eerily this was the day before Muhammed Ali passed away. In these swim camps and workshops, we typically have a set order of skills to present to our athletes, and we present them in a logical building order that allows each skill to build on the next. But even if the athlete is 95% competent in a foundational skill such as head position, for example, the review allow that athlete to find any pebbles or grains of sand that may be interfering with a better execution. There are probably bigger pebbles or grains of sand as well, and at some point, the pebbles become rocks or boulders which are simply too big to be addressed in one lesson, one trip to the pool, and at times, even one training block or season. I used this quote in our clinic and it was well received, and then I investigated the origin of the quote. It was used by Muhammed Ali, but it also appeared in military literature 50 years prior to his use of it. My takeaway from this quote parallels what I’ve learned in my own journey of becoming a better swimmer, triathlete and coach: be courageous and one by one you’ll remove every obstacle in your way. It doesn’t matter how long it takes, or how difficult it seems, you and I have the skills and tools we need to improve bit by bit…one pebble out of the way a ta time. We can accomplish far more not only as triathletes, but as individuals than we think we can because we often don’t even attempt to do something more. 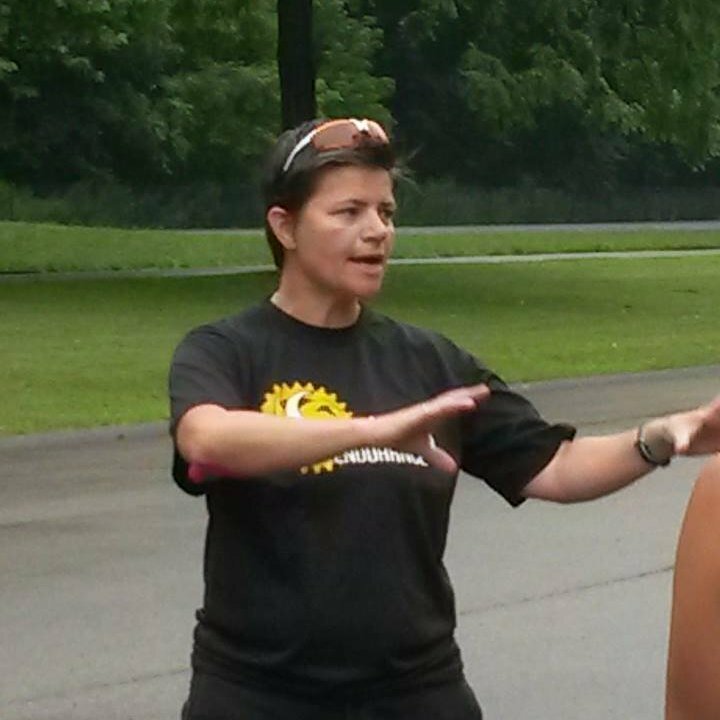 Coach Suzanne leading a skills clinic while wearing a walking boot! It is important to monitor your progress through an injury so as to know where you stand. This is made much easier once you start monitoring yourself while healthy so that you have something to compare it to. When you are injured, monitor how you feel every day. In general, how do you feel doing different tasks, at different times of the day. At the end of the day, it’s up to you to monitor how you’re feeling and set goals for yourself. When one is injured,monitoring what aggravates the injury, how it is recovering, and what hurts or doesn’t hurt is important to track and look back on progress. The best way to improve when one is healthy is by monitoring ones progress, which may be done through software like Trainingpeaks.com (not an affiliate link, although I do use them). As I write this, I am edging my closer to a start line. My body is close to full health and as my fitness builds, soon it will be race time again. Nothing excites me more than the thought of battling with the best in the world. But how did I get here? How did I, and so many others, get through such a long period of injury? Good luck to Kirsten Sass, Steel City Endurance athelte coached by Suzanne Atkinson in this weekends Duathlon World Championships in Aviles, Spain. 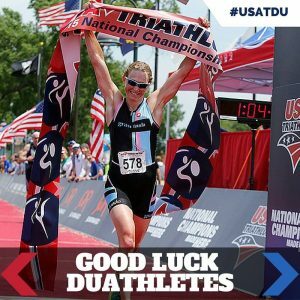 Kirsten earned her spot in Team USA by winning last years sprint and standardized Duathlon National championships on the same day! 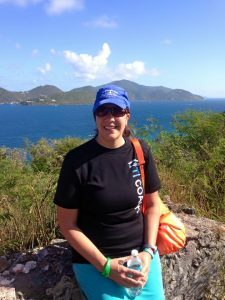 Kirsten entered 2015 wanting to improve her running form and dedicated herself to both technique as well as training. 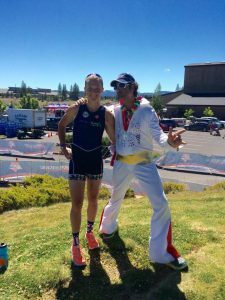 Running transformation camp with Bobby McGee early in the season set the stage for her to not only improve her form, but also quickly improve her post bike speed and resiliency in run training. Her “secret” run training included short post bike race bricks. Not simply doing a hard bike ride followed by a trainig brick, but competing in road bike and time trial races (often winning) and then immediately doing a quick 10-15 minute run. These sessions forced her to learn leg turnover after digging deep in a race effort not just a hard trainig effort. The difference may seem subtle but it’s significant. Kirstens training also included progressive training blocks that built strength, leg speed, neuromuscular connections and of course overall fitness. Her run improvements since her stress fracture in 2013 have been from a long term planning arc, and not from a need or desire to hit a specific pace at a specific time in her season. This is is the true result of process over outcomes…competing with team USA at the World Championships. 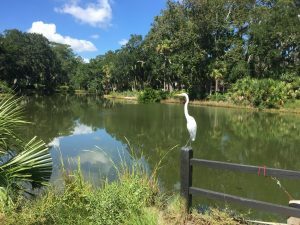 Open Water Swimming & Spring Triathlon Season is here! The first local triathlons are coming up soon and our local club membership kickoff is right around the corner. This summer two local to the Pittsburgh and Eastern Ohio area lakes will have organized open water swimming for triathletes including safety boats as well as buoy marked courses set up. It’s my favorite time of the year! I’ve invited Dinah Mistilis of Discovery Aquatics in Moorsville, NC, my fellow Fresh Freestyle author who also received the distinction of Master Coach during her time with Total Immersion, to share some of her insights with you and I. Dinah has distinct advantage as a triathlon & open water swim coach of living right on a lake with an endless pool in her ground floor. Are you getting the picture? Take a day trip to Moorsville, spend a Saturday doing a 90 minute endless pool session, have a snack then go straight out on the lake to put your open water skills into practice. What an ideal setup for triathletes! Dinah your swimmers are lucky to have you there. Here is Coach Dinah’s post…and if you read to the end you’ll also find information for our local open water swim events you can put on your training calendar. This time of year is wonderful! The air is getting to be that perfect day time temperature and the lake water is not far behind. 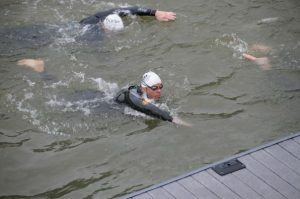 Open water racing is underway and the first local triathlons have been completed. Last week also saw Discovery Aquatics athletes swimming at the USMS National Masters competition in Greensboro NC. So much swimming to be done! If you have taken a break from swimming that is okay too.Most of us will take a break from swimming at some point. It may be a few weeks, months or longer between swims. Making the decision to head back to the water is the first step. Now, what to do when you get there? Take these ideas with you to make the first swim back enjoyable, purposeful and successful so that you will want to do it again. and again. and again! 1. Relax Into It – choose a warm up distance and pace that is a comfortable for you. The goal here is to find relaxed exhalation and inhalation, and to keep the body tension free. Use this time to make a connection with your environment by stimulating your senses – what do you see, hear and feel? It may be 4×25 repeated 3 times, or 6×50, or 3-5 x 100, or a 300, or a 500. Make it your practice from the start by feeling what your body can do comfortably. 2. Find a Focus – training yourself to think about swim technique in all of your practices is important. Start in this practice by repeating your warm up distance, this time with one swim focus in mind. You may recall the focus from previous coaching, or from watching a swim video, or self assessing your stroke, or by watching graceful swimmers at the pool. Make it your practice by feeling the focal point and holding the thought and form for this set. 3. Add Some Speed – just enough to wake up your neuromuscular and cardiovascular systems. Choose some short distance repeats, a series of 25s or 50s and pick up the pace. Keep the focus from the second set and allow yourself recovery time between each repeat. 4. Warm Down and Reflect – round out your first swim back with an easy relaxed warm down. Use this time to congratulate yourself and to reflect on the swim. What went really well today? What can you improve? and….When will you be back for the next swim? Thanks coach Dinah! We always love your insight. Here is information for the local open water swims in our area of southwestern PA and southeastern Ohio. Be sure to put these on your calendar and note what the requirements & costs are. 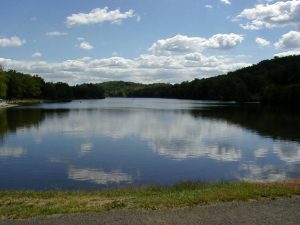 The first opportunity is at Keystone State Park with a series of four monthly swims by No Boundaries Fitness. Each swim day has two start times, 10AM & 11AM. Show up for the first, or the second or for both. Safety kayaks will be present. The second opportunity is weekly Monday night swims at Lake Arthur in Moraine State Park. These are set up by Joella Baker of Get Fit Families. In addition to the ‘open house’ swim setup, she has several open water races on her calendar as well. Joella’s swims have become something I look forward to every summer. Whether you swim 200 yards or 2 miles, it’s so gorgeous to swim in the setting sun on the lake with the safety of a marked course and plenty of kayaks. Usually after I swim I’ll hop in a boat to do some coaching as well. This summer I’ll be doing some mini open water clinics in conjunction with her swims as well. If you’d like to be notified of those events, please take a moment to fill out this contact form.